The SMC Kinetic Series has been specifically designed to meet all your personal protection requirements. 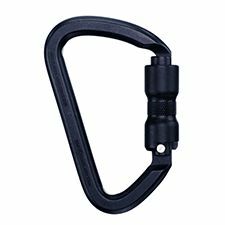 Built from the ground up this carabiner gives you the best of the best in carabiner functionality. The Kinetic Series features a key lock nose, 0.98 gate opening, and screw or Auto-Locking gates. Weighing in at 2.8 oz. (Screw Gate) and 3.2 oz. (Twist Gate) you dont have to sacrifice strength for weight when working at height all day long.